Gareth here offers three false statements (I still hesitate to call them lies, though he has made them before) and a diversion. The so-called raw data from NIWA is actually slightly cooked – it’s monthly data, not daily observations; anyway, listen: we didn’t ask for the data! The adjustments “required”, and listed by NIWA, are simply the net arithmetical differences between the monthly data and the official seven-station series. Gareth fudges this one shamelessly. There could have been more than one adjustment at a station, but you can’t tell, because you only see one figure, and of course the most important information is missing: the reason why each change was made. The methodology is available? That’s a real laugh. Where has Mr Renowden been all these months? His claim to have been following our “weird obsession” very closely is falsified by his words. We have clearly explained our diligent examination of the references provided by NIWA in answer to our request for the adjustments and their reasons, so he should know that both the adjustments AND the methodology for performing them are nowhere to be found. If Gareth still disagrees with this, he’s a truffle short of a lunch. Oh, we never asked for the methodology. NIWA just offered it. His diversionary offering about the need to make adjustments is just intended to be insulting. We never said there was no need to make adjustments, but we did ask what they were for. Fundamentally, the Climate Science Coalition’s original report said adjustments weren’t necessary. When that was pointed out to be wrong, they shifted their ground, saying they wanted a list of the adjustments. When they were given a list of the adjustments, they then started finding fault with everything else. Well, here we go again. Gareth, you’re wrong. Please provide a reference for this assertion. We said that NIWA gave no reasons for large adjustments, yet they made many large changes. So we asked them why. We didn’t “shift our ground”, since the list of adjustments was in our original request. It’s just emotional claptrap (not to mention wrong) for Gareth to then say we found fault with “everything”. These were falsehoods, broadcast to the nation just this morning. If I were feeling charitable, I might counsel Renowden to take more care over the facts; if I were not, to stop telling lies. 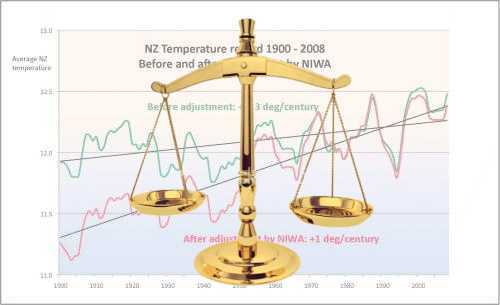 Immediately after the Climate Science Coalition started making a fuss, NIWA went out and made a selection of stations that had long, uninterrupted temperature records, in other words, these were records that did not need any substantial adjustment. They produced a series for New Zealand that showed that the temperature, if anything, was increasing slightly more than the series that the Climate Science Coalition had already complained about. There is so much wrong with the 11-station series Gareth ought to be ashamed to bring it up. It was comprehensively demolished on June 1 by Barry Brill. It uses two class 4 weather stations, with errors as high as 2°C; despite claims that the selection was made because the sites had never moved, six of them had moved; the so-called eleven station series began with only three, all of them at low-temperature sites, blatantly skewing the trend. University of Otago pro-vice-chancellor of sciences, Keith Hunter, says that court action against NIWA is “stupid” and “just creating confusion”. He told Radio New Zealand the courts could not determine whether or not the adjusted records had been adjusted properly. Stupidly, Prof Hunter has not read the documents we filed; he should have refrained from commenting until he had. We’re not asking the court to determine the accuracy of the adjustments. It can only be done by people who have an established scientific reputation in meteorology. So if the Coalition has got those people they should do the analysis. If they haven’t they should find someone else who has got that. Where did Hunter imagine the questions he’s answering? He didn’t hear them from us. We are simply asking about NIWA’s analysis. Who doesn’t by now understand that simple fact? We could do our own analysis, but we have questions about the public analysis done by the public scientists at NIWA. Prof Hunter: ask NIWA why they haven’t answered our questions. There is nothing sinister about making adjustments. Measurements are often adjusted because of procedural differences between stations or changes in instruments with time. Yes, but why mention the word sinister? We never suggested it. Just tell us what the adjustments were and why NIWA made them. “The Coalition are just creating confusion. Throwing mud and if they throw enough mud some will stick and organisations like NIWA get dragged down in it,” Prof Hunter said. Was that something about fighting them on the beaches? Seems a tad over the top. One hopes that NIWA, if they have the courage to see through a High Court hearing, will call Mr Renowden as a witness. NIWA jigs will be better entertainment than Irish jigs any day. Isn’t that fellow Hunter from OU one of the same fools that now run the once proud and reputable “Royal Society” ? We know NIWA deliberately falsified the records, theres no excuse NIWA you’ve been caught out. I hope the high court see it this way too. One wonders WHO in the high echelons of GOV was behind it. (reason for saying this is that there is so much information that the whole AGW is a deliberate lie taken up by the gullible). It’s interesting that Gareth has posted an audio clip of the Plunket up on his website. I thought Brian Leyland got the upper hand and Gareth was put down by Plunket once or twice. Plunket also made a jibe at Salinger.